Not to feed into any stereotypes or anything, but in general, guys like tech. Oh sure, maybe your fella would be pumped to get a t-shirt inscribed with “World’s Greatest Dad” for Father’s Day, but let’s just say, for argument’s sake, that he might really really like to get an awesome, color-customizable Bluetooth speaker with killer sound instead. Then you’re in luck right now. We were excited when one of our CMT faves, the outstanding Jawbone Jambox developed a Big Jambox with enough hi-fi audio to fill an entire backyard with sound. 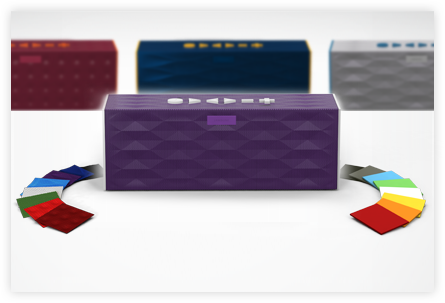 Then, we were really excited when Jawbone launched a cool customization service for its smaller-sized portable Jambox. Now, just in time for Father’s Day, we are fairly jumping for joy that these worlds have collided to produce big sound with big, customizable color–the Big Jambox with 100+ Color Combinations. Adding to all its usual great features (built-in microphone for hands-free calling, huge sound from any phone, tablet or mobile device, and a SmartSpeaker that can customize content and apps), your Big Jambox can now match your living room decor or even your team colors which will do a lot for your tailgate cred. Customize your Big Jambox at Jawbone.